Every now and then Estate Agents like to indulge their geeky side, whether it's for the office or at home. Staff members at Resource Techniques, including the web design team, have compiled a list of recent must-have geeky gadgets for Estate Agents. Ever dreamed of becoming a 007 Estate Agent? Well now you can with the world's first commercial jet pack by the Martin Aircraft Company Limited. The jetpack does not require a pilot's licence, can reach up to an altitude of 2,400 metres and has a top speed of 60 miles an hour. Imagine the faces of buyers when their Estate Agent descends from the sky, lands and says, 'Shall we have a look inside?' 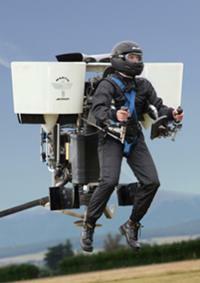 The cost of the world's first commercial jetpack is not cheap at $75,000. Is this a little out of your price range? Estate Agents can buy a Martin Jetpack baseball cap for just $28 from the Martin website. Any Estate Agent that loves retro games will instantly fall in love with the 8-bit tie. The 8-bit tie is not a regular tie, but a clip on. 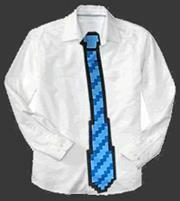 Available from around £14.99 the 8-bit tie will either give you massive "street cred" or reinforce you as a geeky parent. CTO of Resource Techniques, Troy Stanley comments on the Jet Pack, 'I can see the headline now - 'Estate Agent viewings skyrocket'. Ever wanted to own your own Tardis? Well you can't. 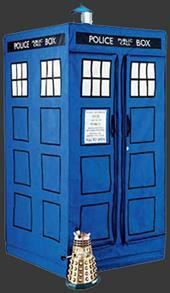 Fortunately for Estate Agents the Doctor Who Tardis Zipperobe by Argos is the next best thing. This self-assembly canvas single rail wardrobe will make any Dalek weak at the knees, if they have knees. This geeky wardrobe will also turn your wallet into a mini Tardis for £49.99. Estate Agents that are fans of the iPhone (or iPad to be released in April) will love this geeky gadget, iPhone coasters by meninos. The 16 coaster set includes all the standard icons that reside on the homepage of the iPhone. The geekiest of Estate Agents will notice that the SMS coaster includes the letters SMS, whereas the iPhone doesn't. The cost of Apple icons protecting your wood from watermarks? £40! Estate Agents, are you always filling up your 4GB, 8GB or 16GB USB/memory sticks? With the Kingston DataTraveler 310, this could be almost impossible to achieve. The DataTraveler 310 has a whopping 256GB, which is much more than many older computers. Again this product is not cheap. The DataTraveler 310 will set Estate Agents back from just over £600.